March 2011, at age twenty-two (actually on my twenty-second birthday itself), I flew from Belfast to Edinburgh for Nicola’s workshop. She was promoting her forthcoming book, ‘Write to be Published‘ off the back of her ‘Help, I Need a Publisher!‘ blog that I had been reading religiously for months. I was actually telling my husband this the other day – about how, for my first couple years of ‘trying to write a novel’, I spent most of my writing time actually reading posts about grammar, punctuation, and the publishing process instead. Following my research, I was feeling pretty confident in my abilities. I expected Nicola to be wowed by both my talent and the novel I was working on. As it turned out, I wasn’t so good at the writing thing. I’d been all through primary and secondary education – with even some university experience – and I was still pretty clueless about voice, and tone, and point of view. I didn’t know about indenting lines. I didn’t even know you always had to start a new line if someone new started talking, figuring that it was only really necessary if the dialogue switch wasn’t clear. My dialogue switches were not clear. I knew when I’d moved into a different character’s head, but anyone else reading my work didn’t. Nicola very delicately had to tell me that what I’d given her was an indecipherable mess. She actually felt so bad, she offered me a one-to-one session instead of going to her workshop. I went to the workshop, and I did learn a lot – mostly that I was way out of my depth. 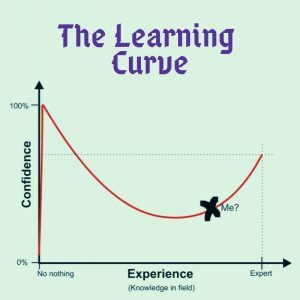 You see the graph I’ve put in the top left of this blog post, charting experience against confidence? To that point, I was right at the start of it: knowing relatively nothing but believing myself brilliant. I’ve marked on said graph the where I think I am now, but who’s to say? The whole point of it is to show how clueless we, as a species, are about comprehending our own abilities. What I can say, objectively, is that I’ve written a hell of a lot more words now than I had back in 2011. I’ve sat with those words for longer. I’ve had more of them published, and the feedback I get these days is mostly positive. The thing about working in a creative industry is that there isn’t a clear career ladder. Everyone finds their own path in a different way, and everyone’s journey is a different length. So, it’s hard to tell how well you’re really doing, but I still think reflecting on how far you’ve come is important. What happened for me between 2011 and now? Well, it was 2012 when I joined a writing group and tried NaNo again. And I won, completing 50,000 words in thirty days! That was the same year I self-published my first (and second) collection of poetry and short stories. I’ve been taking part in NaNoWriMo (and CampNaNo) every year since, sometimes meeting my goals, sometimes not. July 2013 was when I started writing fanfiction, finding other people’s worlds a really great place to hone my craft. In 2014 and 2015, I won awards for my fanfiction. 2015 and 2016, I was shortlisted for the Bangor Poetry competition and in 2017 I got a poem in an anthology by Arlen House. Last year, I got a full bursary to the John Hewitt International Summer School. These are the milestones by which I measure myself, these days. They won’t be the same milestones as others, and that’s okay. The milestones don’t come up as regularly as I expected, and that’s okay too. I like to think my expectations have got a lot more realistic. Back in 2011, if you had told me that I still wouldn’t have a novel published eight years later, I would have been devastated. I would have considered myself a failure, and I would have given up there and then. I couldn’t have begun to conceive it taking that long. Now? I’m mostly relieved it hasn’t taken me longer to get to this point, where I have a pretty solid novel that’s out on submission and funding from the Arts Council of Northern Ireland to write the sequel. I am almost thirty years old and I know for a fact – because they’ve told me – that some other writers are impressed with what stage I’m at in my writing. Just goes to show, doesn’t it?